Home » The blog » Incredible India » India’s Garbage Problem. Who Cleans India? India’s Garbage Problem. Who Cleans India? India's Garbage Problem & Who Cleans India? Good garbage, bad garbage; The animal cleaners; Education, but…; Social issues and India’s garbage problem; Governning issues and India’s garbage problem; Sacred service, or dirty work? In a previous post about India’s garbage problems, I wrote that the complexity of the issue is as big and as vast as the garbage mountain itself. And there is more to it than meets the eye – social issues, governing issues, traditions. There are even religious dimensions, like everything India. I will not presume to cover the topic or to get remotely close to fully understanding it. I will just describe a few personal observations and a small sample of relevant information on the topic I could gather online. Garbage is a wide umbrella term for many things. Saving the planet one cow dung at at time – Part 2. Cow dung and the feminine element. On the other end, some of the modern “garbage garbage”, especially the plastic waste, is non-renewable, non-decomposable, and useful only if you actually get to recycle it on a meaningful scale. A few kindergarteners doing small art projects with platsic caps and containers are not going to “save the planet”, but it raises awareness. I have not seen recycling containers in India. Having a general garbage bin here and there was by itself quite miraculous. In a previous post, I have already described the massive flow of plastic trash from Indian villages up in the Himalayas into the rivers and the oceans. India wouldn’t be India without its animals. The cows are the glory of the country, but they also make things a bit interesting to walk down a street or a village path. On their other end, they take care of some of the human garbage. The monkeys will turn over rubbish bins (when they exist), and consume whatever is edible inside. The donkey above deals with some of the trash by the Savitry Mata Temple, Pushkar, but a lot is inedible. Apart from cows and monkeys, wild dogs roam the streets, especially at night, as well as rats and pigs. In my post “Point Your Finger at Polluter” I refer to very Indian efforts to educate people, as well as to contibutions by NGOs, often operated by foreigners. The imagery of “warriors” is captivating. Hopefully, such a sign could make a difference, if small. Unfortunately, it seems like most of those banners are in English. Therefore they will fall short of reaching the vast majority of the population. It is doubtful if many “polluters” can read at all. Still, I’ve seen enough trash abusers among the middle-class Indian tourists pilgrimaging to the Bhagsu Falls, so signs can have some effect. Everything counts. Another major problem is that there’s no sense in education if there is no way to dispose of the trash, no infrastructure. In my small efforts to try and bring the garbage issue to some locals’ awareness, I usually got positive responses. Most people were not feeling good about the situation and wanted to improve. But there are millions of poor people who need work.. However, one man told me: “This is how we provide a living to millions of people who would have no work otherwise”. In other words, a higher class person will throw his trash on the ground, deliberately or unawares, assuming a lower class person will clean after him. This man was OK with it, since he believed he was doing the lower caste person a service. This in his eyes is how society “works”. Only it does not work. The amount of garbage that is NOT cleaned by anobody, despite all the slave work, is astounding and destructive to an extreme. This might be especially true in the countryside, where trash thrown into nature is not picked up. Additionally, that system and that mindset keep these “lower people” “in their place” with no chance of improvement. By getting people to believe, like this man, that trashing is for the social good, India is setting itself not only to perpetuate and augment the social divide, but also to drown in its own garbage and drown it into its holy rivers and the world’s oceans. Nothing to add. What can be said? Since I personally haven’t seen things that bad, I’ll go back to what I did observe. Most people I’ve seen working cleaning in India had their faces covered, or veiled. Most were women. The guy cleaning Mumbai’s ocean promenade in the photo below was the first man I saw at that job. Male street sweeper. Mumbai ocean promenade. Most women clean their own houses. Here and there an enlightened husband “helps” or even shares the load, especially among the young. Professional house cleaners are 90% women, even though many guys started finding the job lucrative and, therefore, appealing. New immigrants from the former Soviet Union, sometimes academics and musicians, had often worked cleaning houses for the first years after their arrival, including many men. Most have advanced beyond that, but some still do cleaning work. Oftentimes when guys “get into the job”, they start small companies and end up employing others… That is, of course, rare with women. On the other hand, cleaning his car on a Friday afternoon is a status activity for the average Israeli male. Professional car washers are almost always Arab, at least in Jerusalem. Cleaning apartment blocks staircases is a male student job. Cleaning offices is female. Cleaning the airport is unisex, with many “Russians” still employed. Cleaning Jerusalem restaurants is predominantly an Arab male job. Cleaning schools can be unisex, but I’ve mostly seen women. As to streets, it is an only-male job. In Eilat, it would be Sudanese and Eritreans. In Tel Aviv, mostly Africans and other foreigners, again men. In Jerusalem, mostly Arabs from the eastern city. Women don’t clean our streets. Ladakhi woman cleaning street in Leh. It is interesting how our brains are programmed to see things a certain way. I breathed deeply, taking this in. So is this work in the outside world a kind of low class female liberation, or more likely, another example of female exploitation? My dear Indian friend, A., wished to work as a waitress in Manali. She needed a job, and thought waitressing would be fun and enjoyable. But nobody would employ her. She stayed home, living on pennies. In similarity to the Muslim world, serving at restaurants seems to be an exclusively male occupation in India. When you cross over from the Jewish part of Jerusalem to the Arab part, serving changes gender from a predominantly female job to a male territorial zone. I’m trying to understand the rationale. Females are not supposed to be accessible to males’ overtures. A restaurant could be an environment where male customers try to woo the servers or disturb them. Most women I know in Israel or America who work waitressing, deal with this admirably. But in a patriacrchial traditional world, they are not given the chance. Males’ desires are to be restrained not by themselves, but solely by the women they approach, and at the expense of their employability and their freedom. So how does brooming a busy highway safe and decent for a woman? To my mind, this is a much more dangerous and precarious situation. Perhaps the answer is that the women who do that job: a) don’t have a choice, b) are not viewed as somebody whose “honor” has to be protected. In other words, they are probably at the lowest rung of society, where “caste” raises its ugly head. I needed a certain western medicine. After fumbling around McLoed Ganj, I finally arrived at a pharmacy that might have had what I was looking for. (They did not. I eventually gave up and made do!). The place was dark. The pharmacist was sitting in obscurity at the corner. He fetched a lantern, so I could see what was displayed on the shelves. No, it wasn’t one of the regular electricity outages. I later heard from an Israeli guy familiar with McLoed, that this was common. Many businesses in town were periodically or permanently disconnected from utilities for not paying property taxes, for being constructed illegaly, for not paying bills, etc. This new policy had to do with the Modi government’s efforts to put the foot down on this type of law breaching. I, indeed, saw a road sign in McLoed encouraging people to pay taxes, explaining that they are used to improve everybody’s lives. At least this one was bilingual! Slowly, I started to understand that this huge country has a massive problem with taxes. First of all, the vast majority of the people don’t pay any tax at all. The per capita income in India is $1,963 per year (2017), and the minimum taxable income is approximately $3,700. A large part of the economy is comprised of people squatting just about anywhere and having a small business selling corn on the fire, 10 momos for ₹20, cheap plastic jewelry or apples and apricots. They make little and pay nothing. As in Israel, salaried people are tax-deducted automatically, but they constitute only about 10% of the Indian population. Farmers, who make up 55-60% of the entire workforce – tens of millions of people – are also exempt. Many farmers are dirt poor, but some are rich. Even in that case they do not pay taxes. Furthermore, they use subsidized amenities like water, seeds and electricity. The above article relates this to politics. Many politicians come from this sector. Bottom line, only 37 million people out of a population of 1.4 billion filed tax returns in 2017, out of which 10 million were exempted. This puts the percentage of tax payers that year in India at ~2%!!!! According to The Times of India, quoted in Wikipedia, “Taxation in India”, in 2015-2016, the gross tax collection amounted to ₹14.60 trillion (~$200 billion). Only 1.7% of the population paid. In comparison, in 2015, the American federal government collected about $3.18 trillion.That number includes: Income taxes paid by individuals (47% ), payroll taxes paid jointly by workers and employers (34%) and Corporate income taxes paid by businesses (11%). The population that year was 321 million. Israeli government gross tax revenues in 2016 were 381,824 million shekel. That translates roughly into 100 billion dollars, according to the average exchange rate of ~3.8 shekels to the dollar. That number includes 120,474 million shekels in taxes on income, profits and capital gains, or roughly 31.7 billion dollars. 39,444 NIS were collected in property taxes, 144, 358 in goods and services, including 91,999 million in VAT. The population that year was 8.5 million. No taxes – no services, and that includes garbage management. Normally, garbage management depends on local taxes and is handled state by state and town by town. But if people barely pay the federal government, how much would they pay the municipality? I happen to have an acquaintance from a southern Indian state, who is a local politician. From what he disclosed to me, I understood how meager local budgets are. He, as a deputy mayor, does police and court work, since there is simply not enough staff to take care of those issues. He had only three policemen at his service to take care of a sizable municipality. Apparently, many people prefer him to be an arbiter in cases of disputes or legal difficulties. He gets calls on his cellular 24/7. I know he does a fabulous job, but clearly this is not how things should run. Another significant issue at play here: the economy operates on cash. I was astonished to hear from my travel agent that I needed to pay an air ticket in cash!!! They would not take credit cards!!! With no paper trail, it is easier to avoid or under-report income. Rao, the National Institute of Public Finance and Policy economist, says compliance suffers because Indians generally do not connect the duty to pay taxes with the right to receive government-provided services. She says the government must do a better job delivering what the public needs. When an Indian earning $4,000 a year sees no personal benefit from paying tax, he or she prefers to pay more for a better school for his/her kids than to support the government. And indeed, I met many people with meager means, like the tuktuk driver who took me around Amritzar, who spend their hard-earned money to send their kids to private schools. There are large differences in cleanliness between localities. Remarkably, in Amritzar, a Punjabi city, I noticed 2 garbage trucks in the one day I spent there, and there were no major trash accumulations on the sides of the roads. Punjab is considered a well-to-do state. Leh, in the Himalayan province of Ladakh, was a beautifully clean city. The streets were almost immaculate. There were some garbage bins and people cleaned the sidewalks in front of their stores and houses. Perhaps it has to do with the predominant Buddhist culture, with the strong tourism, or both. In contrast, in Bhagsu, where I lived for a month, the amount of non-decomposable garbage flowing down Main Street with the rains, was appaling. Garbage was thrown everywhere and stayed put until carried by the water. Perhaps Himachal Pradesh towns, despite the tourism, do not pull up enough money for basic garbage collection. NGOs like Waste Warriors cannot replace the authorities, but they help. Justly, the vast poor population of the country does not and should not pay taxes. Unjustly, those who can pay taxes do not always do, due to corruption, nepotism and treachery. Bottom line, I see very small chance for improvement unless something drastic changes. If the society at large does not pay enough taxes, how can the needed funds be alotted to cleaning campaigns, environmental education, recycling and waste disposal? Still, the way I see it, everything is connected. The bottom line is how people are treated, the social class system. This can and should be changed. 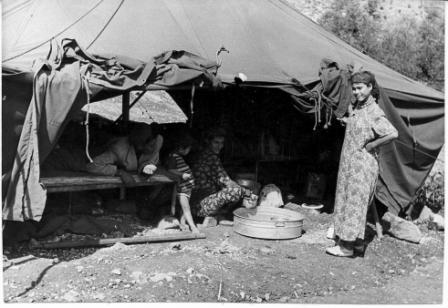 In an upcoming post, I write about what India could perhaps learn from the Israeli experience of the Ma’abarot, the famous and infamous tent and shack cities where new immigrants to The Land were put in the fifties, sometimes for years and years. When there is a will, there is a way. Solving/improving on one problem (economical injustice) can lead to solving/improving on another (environmental mismanagement). Sacred Service or Dirty Work? The twin topic I am addressing is the “good side of garbage” – recycling the organic matter, the saga of the cow dung and the Indian rural women’s role in keeping Mother India and Planet Earth healthy. For more posts of interest about India and other topics – Subscribe!